Note: Many legislative committees do not meet in August, except for the Health System Reform Task Force and several Medicaid Expansion subgroups. Details listed below. Note: During this meeting the committee will discuss the model for charity care outlined in the 8/16/13 document “Strengthening Our Safety Net: A Proposal.” This proposal would recommend the State to charter a nonprofit to establish eight outpatient clinics along the Wasatch Front where patients could come to receive free care. Three clinics would be located in Salt Lake county, two in Utah county, and one each in Davis, Weber, and Cache counties. Join UHPP in welcoming our new executive director at our new office on the west side. Location: All 50 states and Washington, D.C. Note: Look for future announcements about Utah marketplace roll-out events on October 1st and soon afterwards. As part of our education work, the Utah Health Policy Project is conducting free “Health Reform 101” presentations to audiences all over the state. Our presentation, titled “Bringing the Affordable Care Act to Utah: What’s at Stake for All of Us,” provides an in-depth look at how national health reform will impact Utah in 2014 and beyond. Because UHPP is a nonpartisan, nonprofit organization, we can approach this topic in a factual and informative tone for all audiences. How does health care reform affect you and your family? >>To attend one of our upcoming presentations, check out the “Health Reform 101” section of our August 2013 calendar. >>To download a PDF of one of our recent “Health Reform 101” presentations, click on this link. Stay current on the latest state and national health care news with our monthly summary. What’s the human story behind the latest Obamacare headlines? USA Today sent reporters to California, Texas and West Virginia to see what people are thinking and doing as the law is rolled out in those three states. With Utah soon to announce the 2014 premiums on the new insurance marketplaces, it’s helpful to consider this CBPB blog post on how some sources can manipulate the numbers to confuse residents about rate increases. For example, Indiana’s insurance department (which isn’t fond of the ACA) claimed the state’s average insurance rate would jump 70% to $541 a month. According to the CBPB analysis, however, a single average doesn’t explain the whole picture. For instance, a 47-year-old non-smoker in Indiana could purchase a plan for $307 per month, and a 20-year-old non-smoker would pay about $125 per month. Plus, those prices don’t include federal premium subsidies that would reduce people’s out-of-pocket costs even more. Still, the exhaustive analysis completed by the Indiana Department of Insurance may foreshadow Utah’s report. So you might as well get familiar with these comparisons now. Another great source is Five Things To Know About Obamacare Premiums: A Guide For The Perplexed, compiled by Kaiser Health News. Need a quick refresher on Medicaid Expansion in Utah? Here you go. A community workgroup has been studying the issue all summer, and this Salt Lake Tribune article describes all five options that group’s committees are investigating. For example, here’s the proposal developed by the subgroup considering a Full Expansion of Medicaid. Next up: Each subgroup will report during Governor Herbert’s Health Summit on September 26. See the summit agenda here. Then Gov. Hebert will decide whether to include funding for Medicaid expansion in his December 2013 budget proposal. If Gov. Herbert decides proposes some kind of Medicaid expansion, he still needs approval of the Utah legislature during the 2014 session. Wonkblog reports that doctor’s groups are resisting changes that would allow mid-level providers like nurse practitioners to treat patients without direct oversight from a physician. 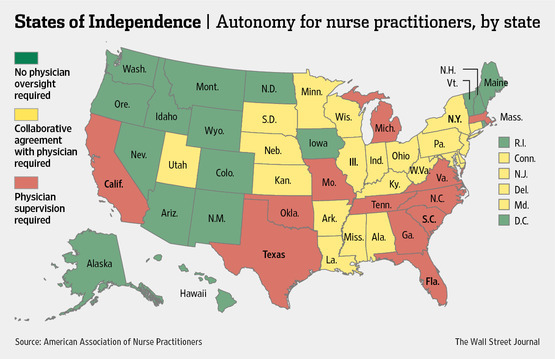 17 states and the District of Columbia already allow nurse practitioners to treat patients directly. Right now, Utah requires collaboration between a physician and a mid-level provider. Last week UHPP gave three “Health Reform 101” presentations in Vernal, UT. A few days later, Rep. Rob Bishop (R-UT) addressed Obamacare during a town hall in Vernal and mentioned that members of Congress get a “waiver” from purchasing insurance on the new insurance marketplaces. Not so says this easy-to-follow-article from the Deseret News that explains a recent agreement that keeps members of Congress and their staffs on Obamacare. More Reform Needed in Mass. If Massachusetts residents think they’re getting less insurance coverage even though it’s costing them more, there’s now evidence that they’re right. Kaiser Health News reports on this troubling development, noting that Bay State premiums rose 9.7 percent between 2009 and 2011, while the value of that coverage shrank 5.1 percent. What’s the deal with the latest Obamcare delay? This one let insurers and employers off the hook until 2015 to cap consumers’ out-of-pocket costs—including deductibles and co-payments. Ezra Klein breaks it down for us. Stephen Colbert has advice for the FreedomWorks campaign to get young people to burn their Obamacare Cards. First, make the cards. Last month UHPP, along with Rep. Jim Dunnigan, Judi Hilman, and Nate Checketts from the Utah Department of Health, participated in a televised townhall on health reform broadcast on KUTV. Watch it on YouTube. There’s a long-running joke among states which, like Utah, run very lean Medicaid programs. “At least there’s [worst-in-the-nation] Mississippi,” is the line that can be heard whenever Medicaid directors or health access advocates get together. Well, now it turns out Utah comes out ahead of Mississippi in another category. The Magnolia State is considering following Utah’s lead in splitting up its health insurance marketplace, according to this Politico article. UHPP’s take? Whether Mississippi is onto something good is a legitimate topic for debate among reasonable people. We’re waiting to see how Utah’s approach works here. Join UHPP in celebrating our new executive director, our new office, and our new navigator grant! Join us for drinks, snacks and a silent auction/raffle! No program or speeches, just a fun time. The Utah Health Policy Project (UHPP) is a nonpartisan, nonprofit organization dedicated to building lasting solutions to the crisis of the uninsured and rising health care costs. With just 41 days until Utah’s insurance marketplace opens for business, here’s the latest news and analysis. One of the most anticipated announcements of Utah’s new insurance marketplace will be the 2014 premiums for qualified health plans. These new premiums will incorporate more robust benefits required by ACA plans. Plus insurers offering these plans can no longer factor in a person’s health history (ie. pre-existing conditions) or gender in quoting premiums. The Utah Department of Insurance is currently reviewing the 2014 rates from the insurance companies who plan to participate in the marketplaces. However, our “wait for the rates” might soon be over, especially given this agenda item for Thursday’s Health System Reform Task Force (HSRTF) meeting. Will we find out the 2014 premiums at Thursday’s HSRTF meeting? Probably not. But we might get a sneak peek at which health plans are participating in the marketplace, and ballpark ranges for their 2014 rates. With the real announcement coming soon, what can we learn from other states that have gone before us? On Friday, Colorado became the fourteenth state to release its marketplace insurance rates (for a list of all the states, see this smart resource). Colorado is running its own marketplaces, unlike Utah, which is splitting the individual and small business exchanges between the feds and the state. But like Utah, Colorado is a clearinghouse state, which means the state will accept all qualified health plans that meet its established minimum standards. You can analyze Colorado’s 2014 rate details here. But for an expert review, we turn to the Washington Post’s Wonkblog. They suggest the new Colorado rates are similar to the rates offered now. For instance, a 27-year-old non-smoker shopping for insurance on Colorado’s individual marketplace would pay $135 a month for the lowest-cost catastrophic coverage plan, and $566 for the highest-level “platinum” level coverage. Whether or not Utah’s 2014 marketplace premiums are revealed on Thursday, here are three ways you can prepare for the news. First, you can read this primer from Kaiser Health News, Five Things To Know About Obamacare Premiums: A Guide For The Perplexed. Trust us—everyone is perplexed when it comes to deciphering insurance rates. This paper points out the common pitfalls that occur when people try to compare ACA rates to existing pre-ACA insurance. Second, you should read this CBPB blog post that explains how some sources can manipulate the numbers to confuse people about rate increases. For example, Indiana’s insurance department (which isn’t fond of the ACA) claimed the state’s average insurance rate would jump 70% to $541 a month. According to the CBPB analysis, however, a single average doesn’t explain the whole picture. For instance, a 47-year-old non-smoker in Indiana could purchase a plan for $307 per month, and a 20-year-old non-smoker would pay about $125 per month. Plus, those prices don’t include premium subsidies that would reduce people’s out-of-pocket costs even more. Still, the exhaustive analysis completed by the Indiana Department of Insurance may foreshadow the report that their colleagues in Utah could deliver. So you might as well get familiar with these comparisons now. Third, numbers and statistics can be sticky things. Take California. When CoveredCalifornia, the state’s homegrown marketplace, released its 2014 insurance premiums in May, some experts claimed the rates were lower than expected, while others claimed they were higher. Who was right? Well, both of them were. Insurance rates for some Californians went up, but most went down. But it took a week of constant analysis and reporting for that realization to sink in. The lesson from California is that it can take a week or more for the real picture—and the most accurate analysis—to appear. More states are unveiling their ACA advertising campaigns. Especially those states with money to spend. Minnesota, which is running its own marketplaces called MNSure, will spend $1 million on TV ads, $500,000 on radio spots, and $400,000 for newspaper ads. This week MNSure released an ad campaign that features Paul Bunyan and Babe Blue Ox, and the tagline, “Minnesota, Land of 10,000 Reasons to Get Health Insurance.” Watch their videos—they are hilarious (Note: If you can’t see the video at the previous link, go to the Star Tribune website and search for a 8/19/13 article with the headline “Minnesota health insurance exchange aims for a big ad splash”) Meanwhile, Colorado’s web and TV advertisements are trying to convince residents that buying health insurance is exhilarating, like winning the Triple Crown, or striking it rich in Las Vegas. What advertising will Utahns see? First, because the federal government is running Utah’s marketplace for individuals, the state won’t promote it like Colorado and Minnesota. However, Avenue H, Utah’s state-run small business marketplace, won a federal grant of $400,000 to advertise using billboards, print and television ads. Look for more publicity about Avenue H this fall. If you or your organization would like to coordinate with UHPP and others to inform more Utahns about their new insurance options, contact Jason Stevenson via email, or by phone, at 801-433-2299. I want to sign up for new insurance, but I don’t have reliable access to the Internet? What should I do? While the websites healthcare.gov and cuidadodesalud.gov (the Spanish version) will be where many Utahns find and purchase new health insurance starting on October 1st—they are not the only places you can go. First, there’s a toll-free phone number you can call to get answers. That number is 1-800-318-2596, and it connects you by phone to the new Utah insurance marketplace. This phone number is available right now and answered 24/7. By calling this number, you can learn about application deadlines, how to apply for insurance, and documents you might need. And after October 1st you can get assistance completing your insurance application and selecting a health plan. And did I mention that information will be available in 150 languages? Second, here in Utah we have a wonderful service called United Way 2-1-1. 2-1-1 is a free telephone resource available all across Utah. You can call 2-1-1 to get answers to all sorts of questions—from how to file your taxes, to how to find a local food bank. And starting this fall, 2-1-1 will be able to help you learn about your new insurance options on Utah’s insurance marketplace. They will even have trained people on staff to answer questions about your application, and what benefits you might be eligible for. Third, there’s a paper application to apply for insurance, along with the online option. While we don’t have a copy of the Utah application yet, it will look something like this mock-up. To fill it out, you’ll need the following information: Your name, age, and address; your social security number and/or immigration status; your employment status; your current year income; your predicted income for next year; whether or not you have health insurance; and your signature. That’s about all. Notice they don’t ask you any questions about your health status. That’s because how sick or healthy you are no longer matters when you buy insurance. Fourth, if you buy coverage on the new Utah insurance marketplace, you might qualify for premium subsidies (also called tax credits) to help you pay your premiums. Basically, the federal government will pay a portion of your insurance bill if you earn between 100% and 400% of the federal poverty level (between $19,000 and $76,000 for a family of three). You can use this calculator to estimate if you’ll be eligible for premium subsidies. And this easy-to-read brochure from Consumer Reports explains how the credits will help reduce your insurance premiums. Fifth, UHPP is already organizing a state-wide system of navigators to provide one-on-one assistance. Navigators are trained experts to help people shop for their new health insurance options on Utah’s insurance marketplace. They can even help you fill out the applications—either online at healthcare.gov, or using a paper application. These navigators will be located at neighborhood organizations and community health clinics. They can meet you in their office, or at the local public library or community center. There will also be more people called “Certified Application Counselors” who can answer questions about applying for insurance, but they won’t be able to walk you through the application process. These counselors will be based at school districts and community organizations. If your organization wants to become a home-base for “Certified Application Counselors,” you can apply here. Last Thursday the federal Department of Health and Human Services (HHS) awarded 120 grants totaling $67 million to over 100 organizations poised to operate navigator programs across the country. Navigators are trained experts envisioned by the Affordable Care Act (ACA to help individuals and families apply for health insurance. The Utah Health Policy Project (UHPP), and its lead partners—the Association for Utah Community Health (AUCH) and United Way 2-1-1—were selected as the nonprofit, community-based navigator in Utah. The three Utah nonprofits will receive $406,788. Other awards made to Utah include$238,000 for Cardon Outreach (see more details below), $126,000 for the Utah AIDS Foundation, and $35,000 to the National Council of Urban Indian Health. Initially, Utah applicants were expecting only $600,000—the minimum level for any state. But HHS was able transfer an extra $13 million from preventive services funds to give Utah an extra $206,000 in grant funds. UHPP, United Way 2-1-1, and AUCH will team up with many other organizations across the state to operate a navigator program. Their goal: Help enroll Utah’s more than 360,000 uninsured residents in new insurance coverage that starts on January 1, 2014. Because health insurance will become more accessible and affordable on the Utah’s new insurance marketplace, navigators will help Utahns fill out applications, apply for tax credits, answer questions about coverage options. Applying for health insurance isn’t a simple process—especially for people without any prior relationship with health coverage. But thanks to this new federal funding, navigators from UHPP, AUCH, and United Way 2-1-1, will be there from day one to help Utahns access and retain the health insurance coverage they need. Here’s how the network will work. One largely unknown winner of the Utah navigator grants was Cardon Healthcare Network, which commonly goes by Cardon Outreach after a 2012 merger. Founded in 1996 and based in The Woodlands, Texas, Cardon Outreach operates in eleven states. The company contracts with hospitals and providers to trouble-shoot claim denials, enroll people in Medicaid, Medicare, and Social Security, and match low-income patients to sources of payment. In August Cardon Outreach announced an expansion of their Utah office at the Sandy Technology Center, where they plan to add 308 new jobs. Cardon also received navigator grants to operate in Pennsylvania, Florida, and Oklahoma, while similar for-profit organizations like Advanced Patient Advocacy (Florida) and Deco Recovery Management (South Carolina) also received federal navigator grants. Take Care Utah Navigator Hub that will connect nonprofit community-based organizations with resources on health coverage options. Are you confused about the differences between Navigators, Certified Application Counselors, and In-person Assistors? So were we. Until we read this excellent summary from Community Catalyst, and this overview from healthinsurance.org. If your organization would like to become a home-base for Certified Application Counselors, you can learn more and apply at this website.